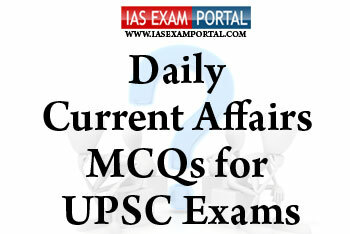 Current Affairs MCQ for UPSC Exams - 8 August 2018 | IAS EXAM PORTAL - India's Largest Community for UPSC Exam Aspirants. Q1. Which of the following are the functions of “climate change finance unit” ? 1) To prepare chapter on Climate Change and Sustainable Development for the Economic Survey. 2) To directly implement programmes/schemes related to climate change . 3) To provide analytical inputs for the National Climate Policy Framework. Which of the above organic fertilizers are naturally occuring ? 1) The Model Bill applies to shops and establishments employing ten or more workers including manufacturing. 2) The bill features no discrimination against women in the matter of recruitment, training, transfer or promotions. 3) According to the bill no Adult workers shall be required or allowed to work in a shop or establishment for more than 48 hours in any week and nine hours in a day. 1) There has been a steady decline in the number of HIV cases in India. 2) Unsafe sexual practices are the main cause of HIV prevalence in north eastern states. Which of the above statements are not true ? Q5. The mahadayi water dispute tribunal was created to solve the water dispute amongst which of the following states ?